Enter the information for the new location. 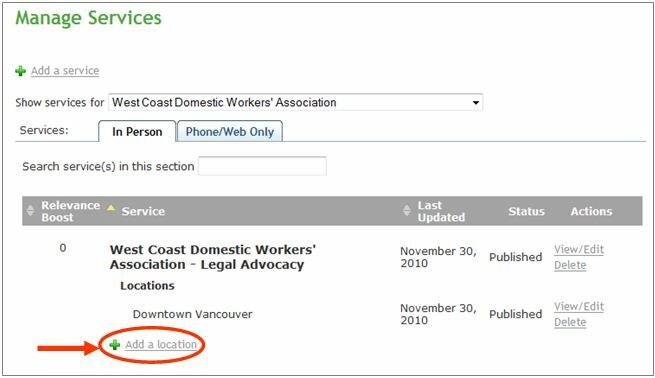 For help on filling in the form, see Adding a new service. After clicking Publish, you will see a dialogue box asking you to add publishing notes. Please write the notes and click Publish with notes. 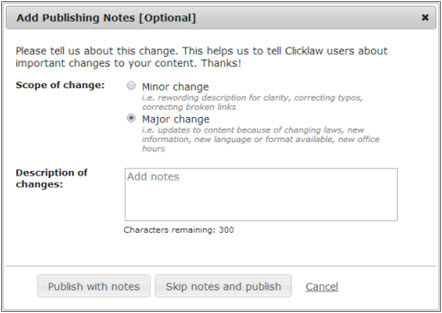 Highlight the information that your audience will find useful about the new location, because the Clicklaw Editors may post the news to the Clicklaw Blog. You could also click Skip notes and publish to publish the location without submitting any notes. If you would like to start over, click Cancel. This page was last edited on 6 June 2014, at 12:12.